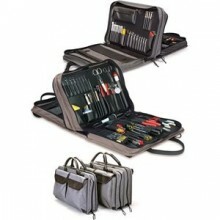 JTK-7500 is a basic medical equipment tool kit in a single-sided Cordura® Plus case with two removable pallets (#9 and #10). It has three outside flapped pockets for extra storage. One pocket measures 15" x 11" x 2" and two pockets measure 7-1/2" x 11" x 2". Hex key set, ball end (8): .050-5/32"
Pliers (4): diag. cutter, 5-1/4"; groove joint, 7"; diag. cutter, 4-1/4"; needle nose, 6-1/2"
Screwdrivers, Phillips (3): #0 x 3"; #1 x 6"; #2 x 4"
Screwdriver, slotted, (3): 3/32" x 3"; 3/16" x 6"; 1/4" x 4"
Screwstarters (2): .102 x 6"; 9/64" x 6"
Wrench set, inch (7): 13/64"-3/8"
Click the button below to add the Jensen Tools JTK-7500 Inch Medical Equipment Kit in Single Gray Cordura Case to your wish list.